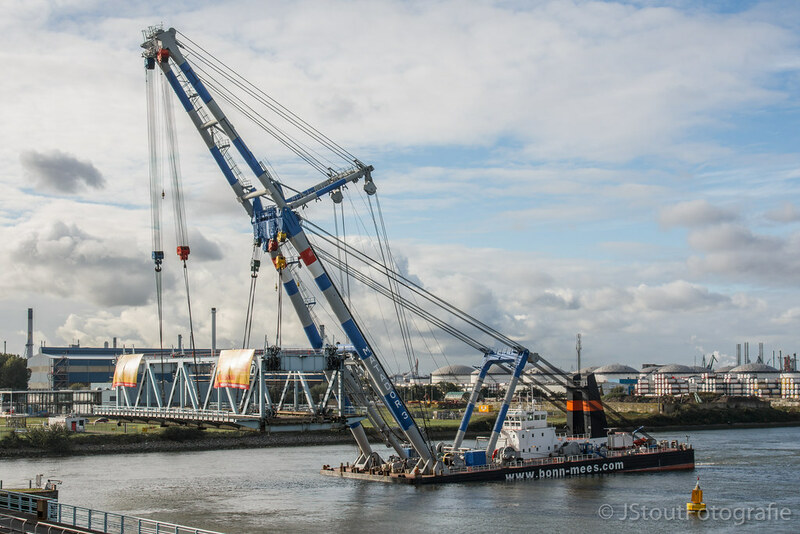 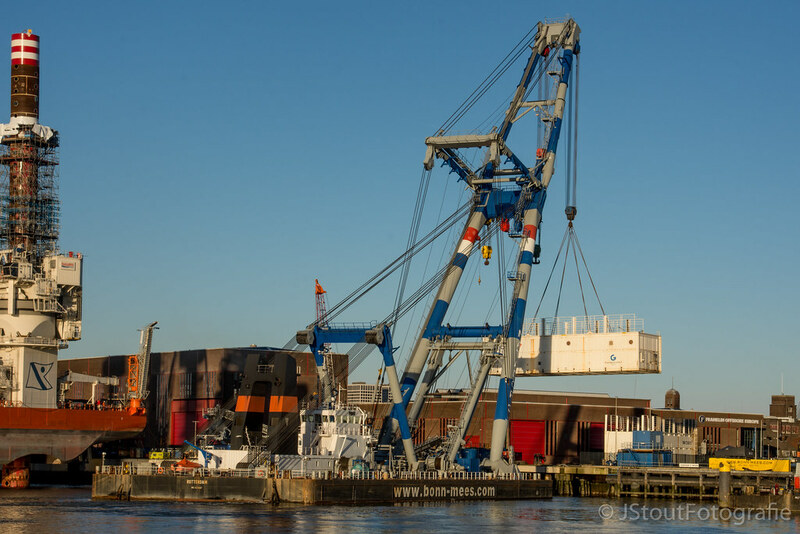 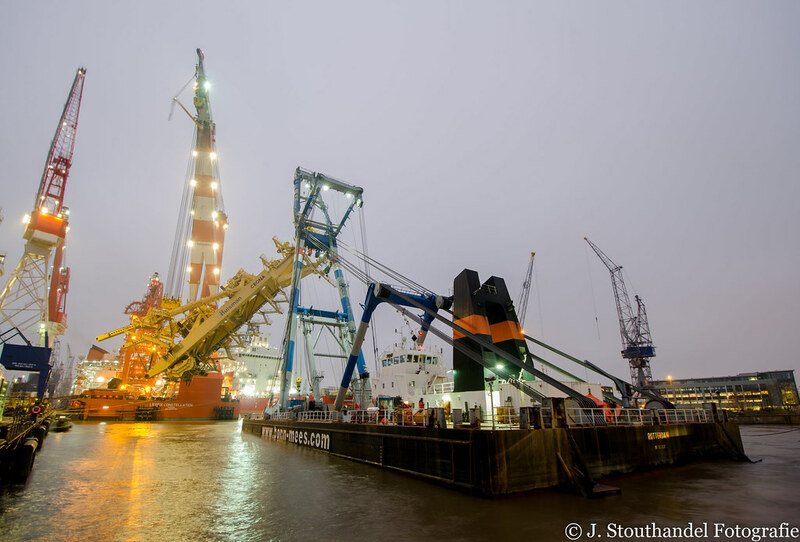 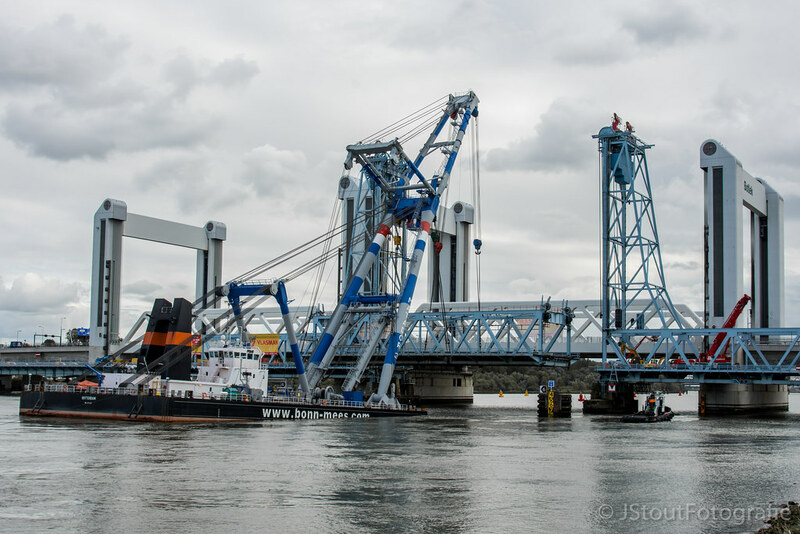 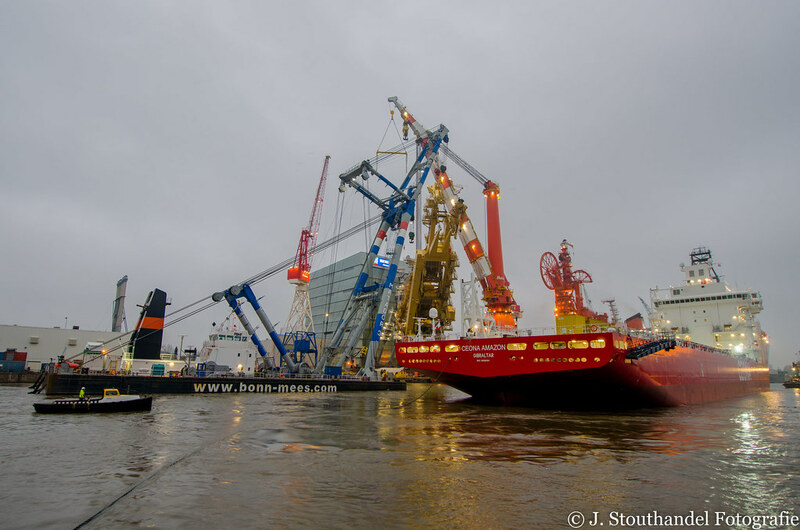 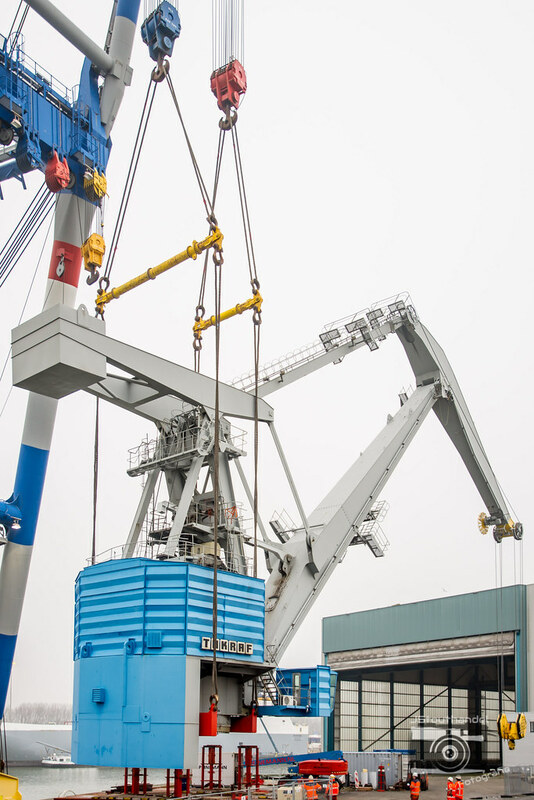 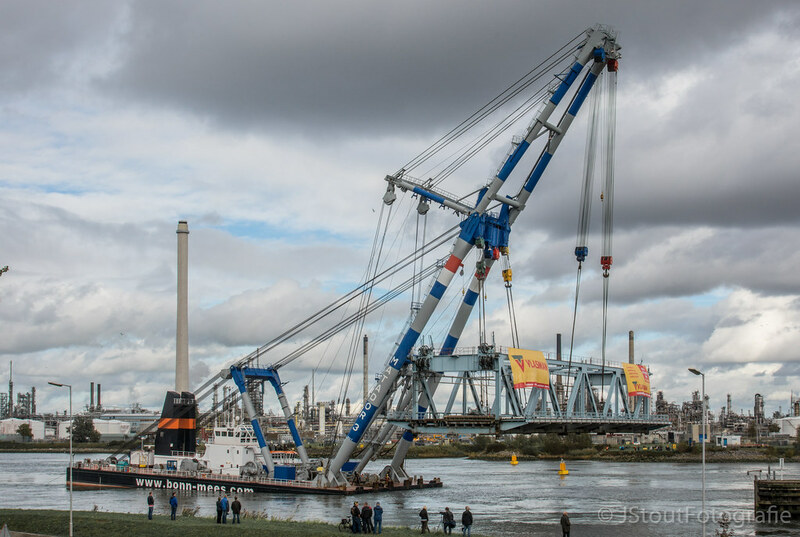 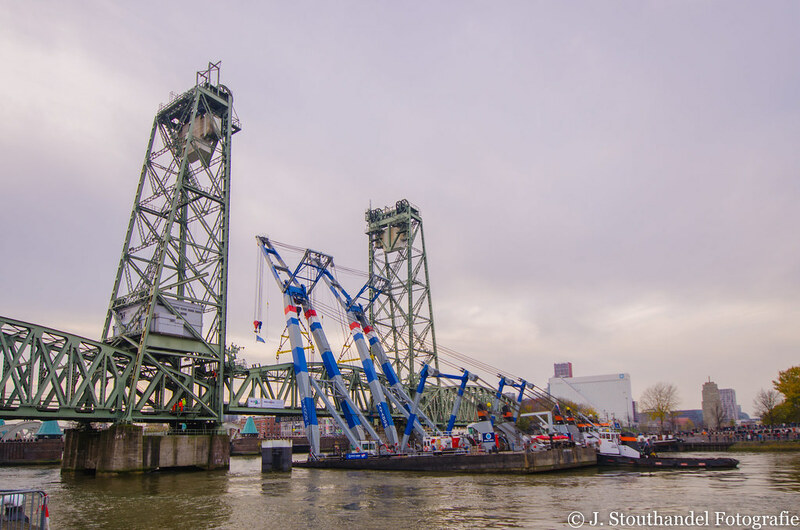 November 23th 2014, Matador & Matador 2 lifting out the 'Hef' in Rotterdam with a weight of around 550 tonnes. 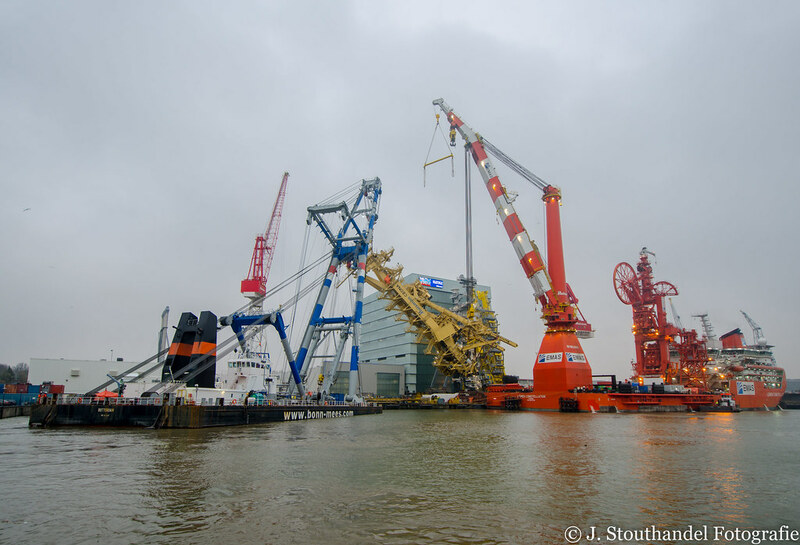 January 6th 2014; Setting a J-Lay tower under the right angle for the big lift at the Huisman yard in Schiedam (NL). 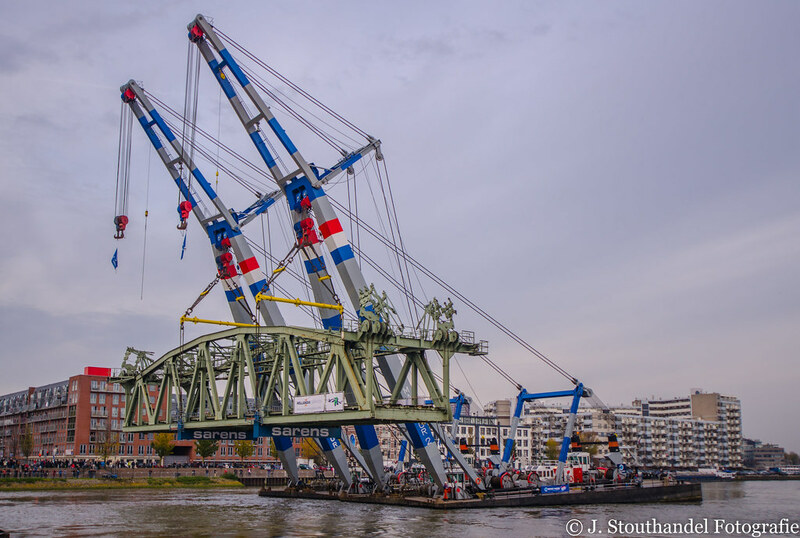 Dieser Post wurde am 15.10.2017 um 22:39 Uhr von jelco editiert. 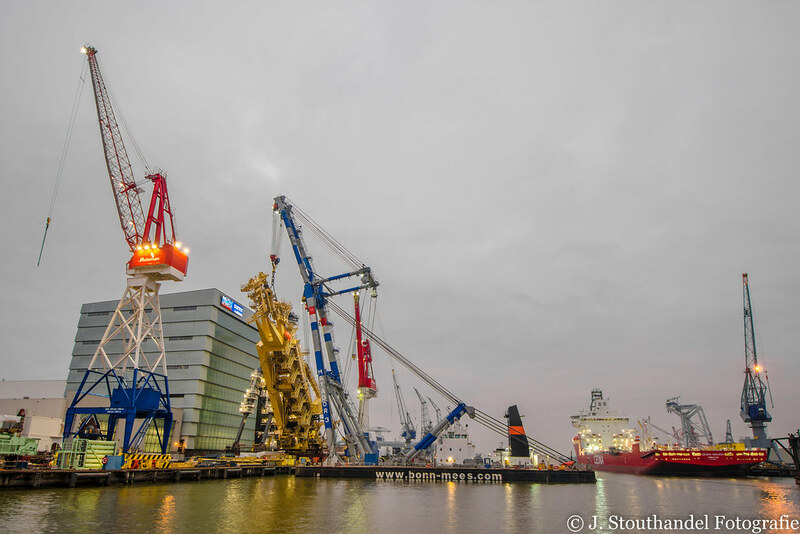 January 7th 2015; Picking up the 1900t J-Lay tower from the Huisman Quayside together with the Lewek Constellation . 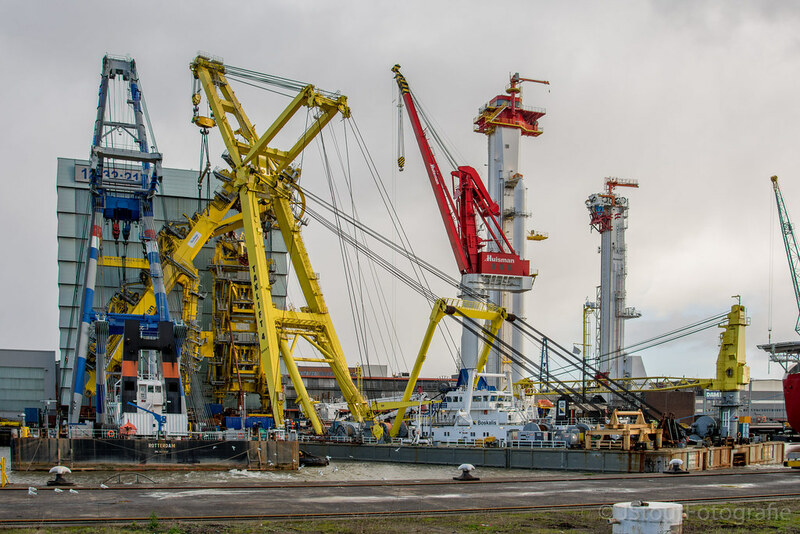 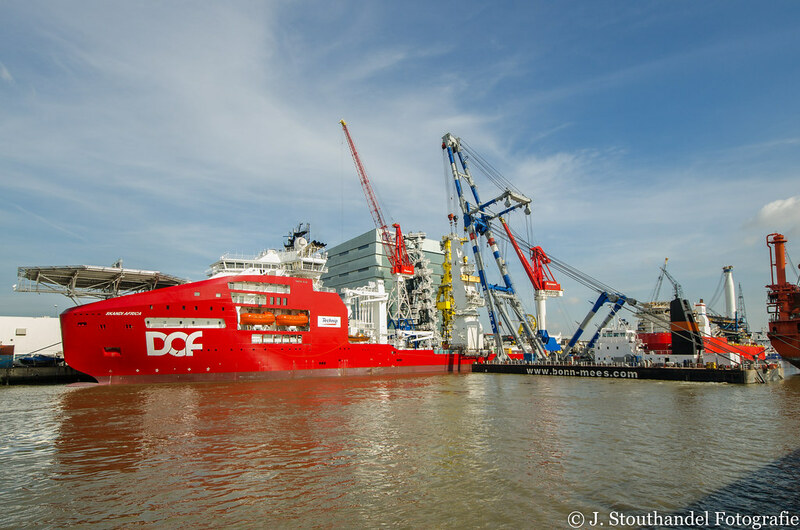 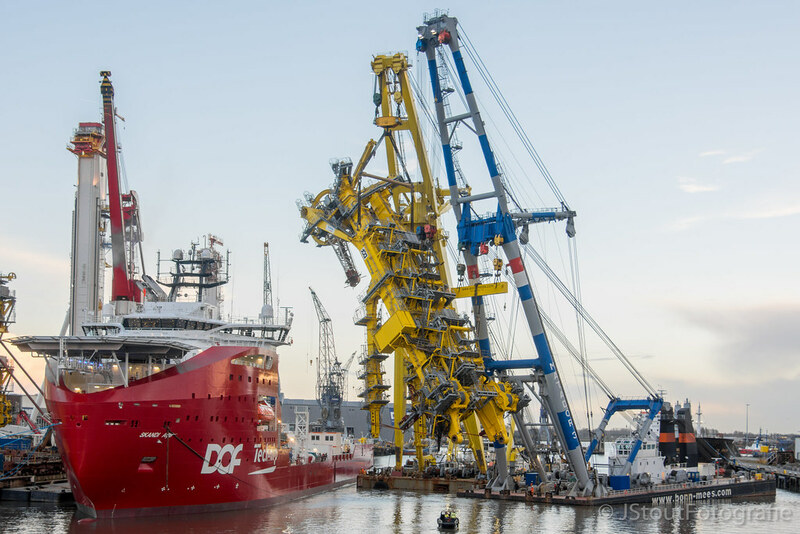 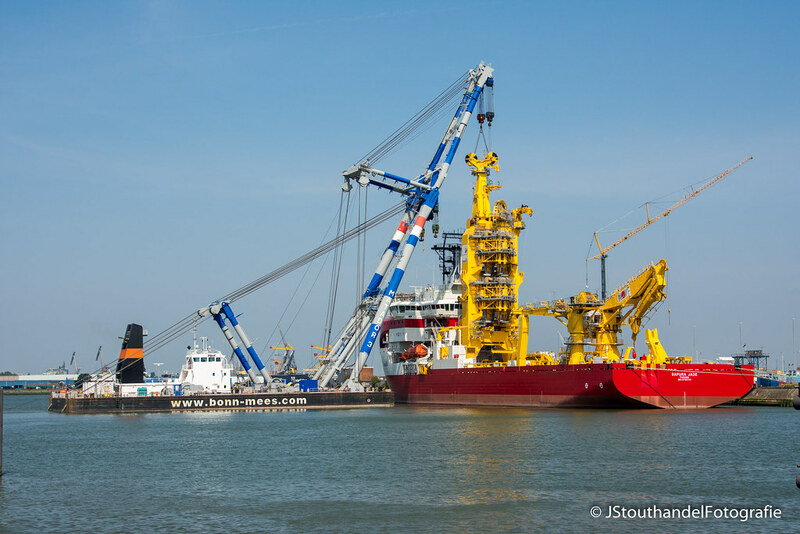 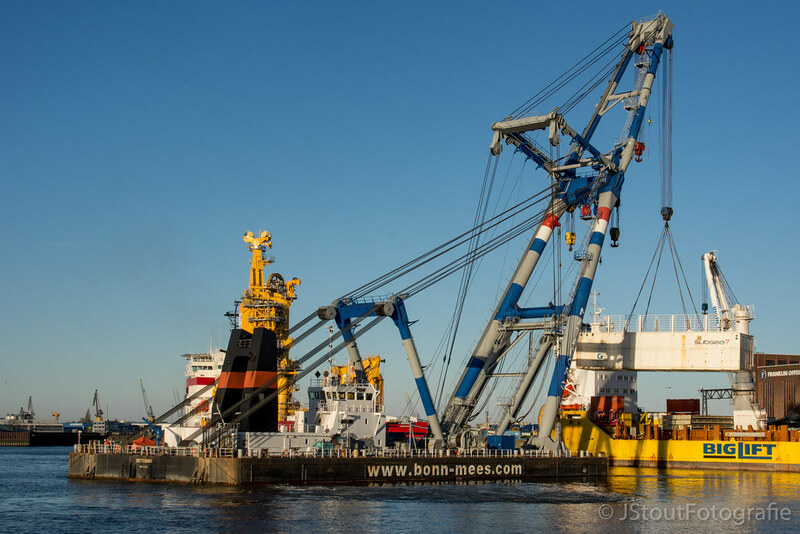 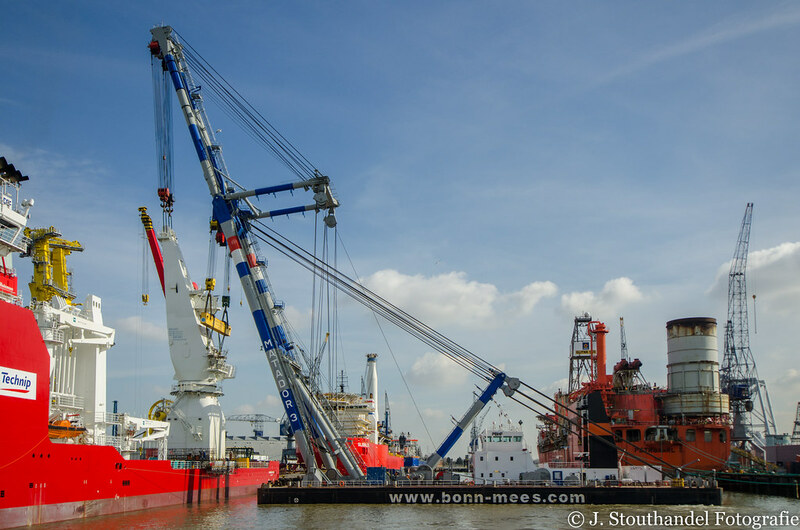 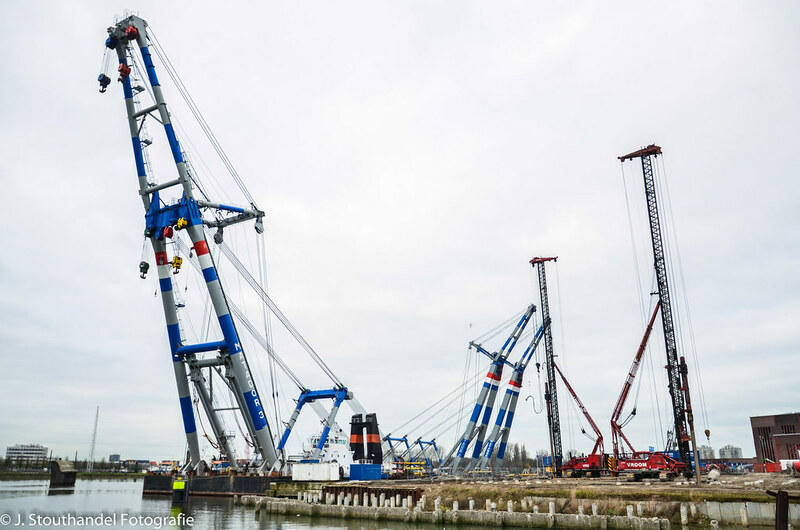 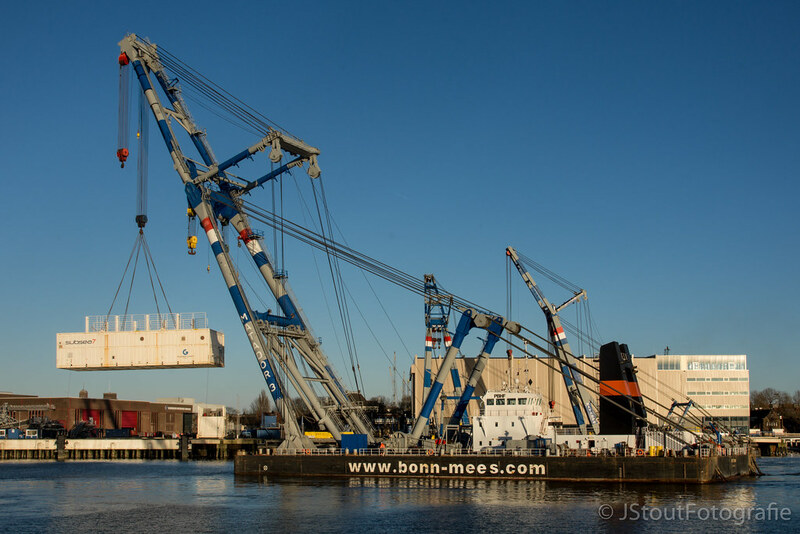 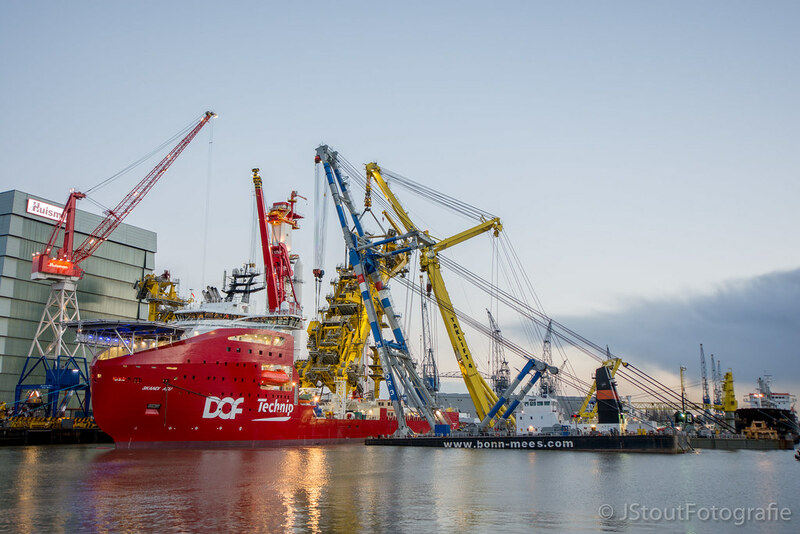 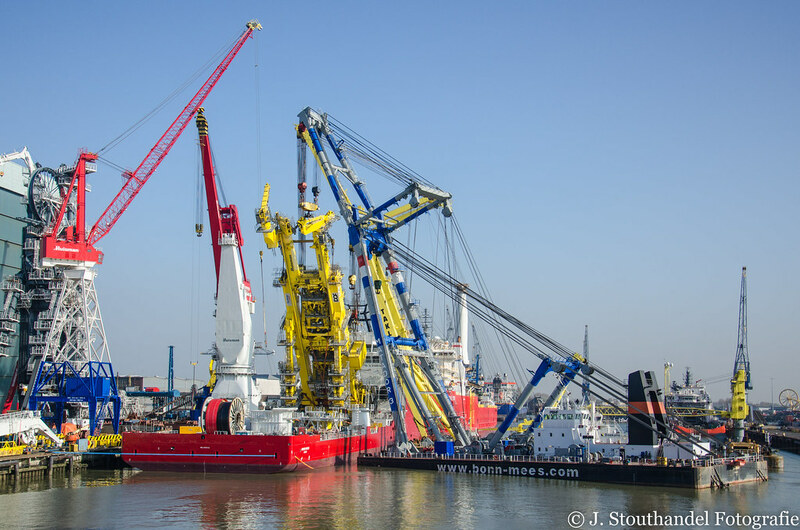 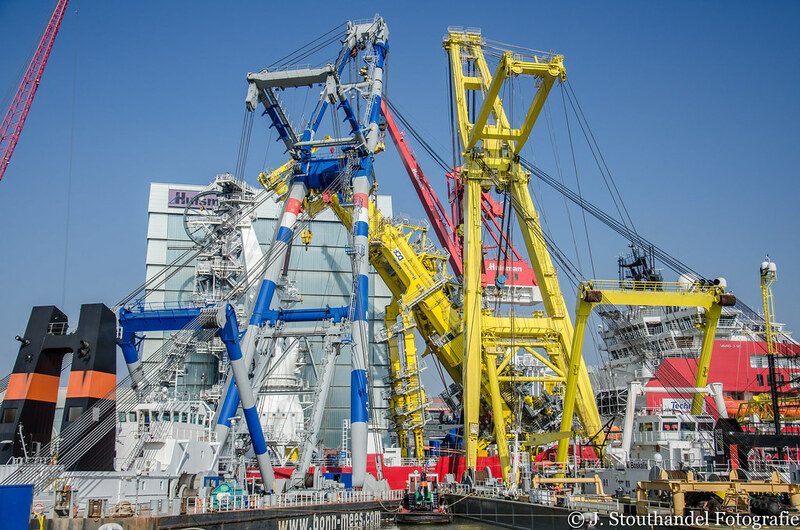 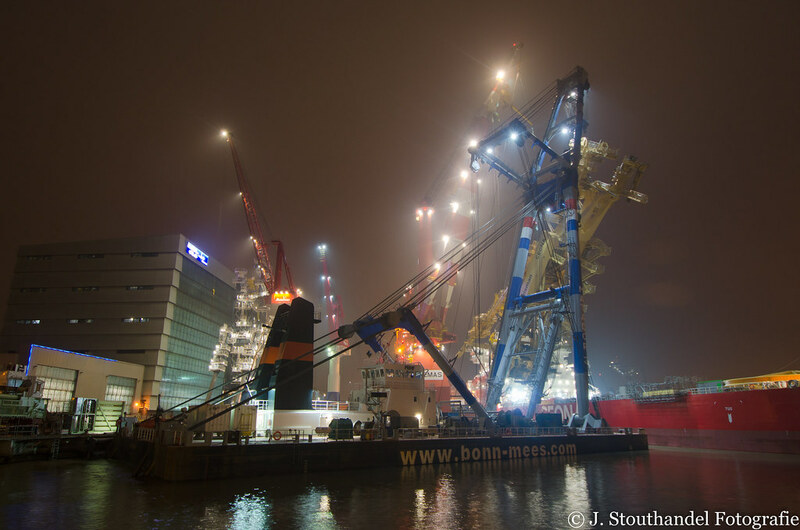 Ceona Amazing could then take it's position..
April 8th 2015; At the Yard of Huisman Schiedam, the Matador 3 placing a 900mt boardcrane on Technip's Scandi Africa. 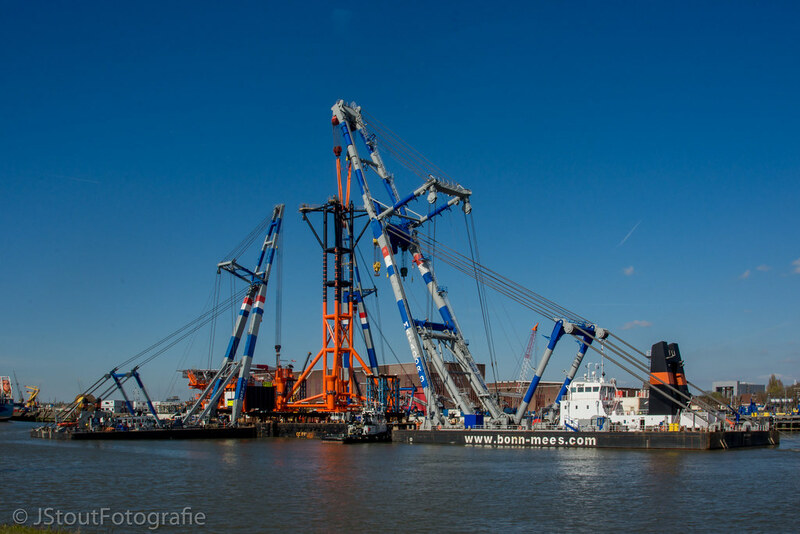 Spectacular pictures! 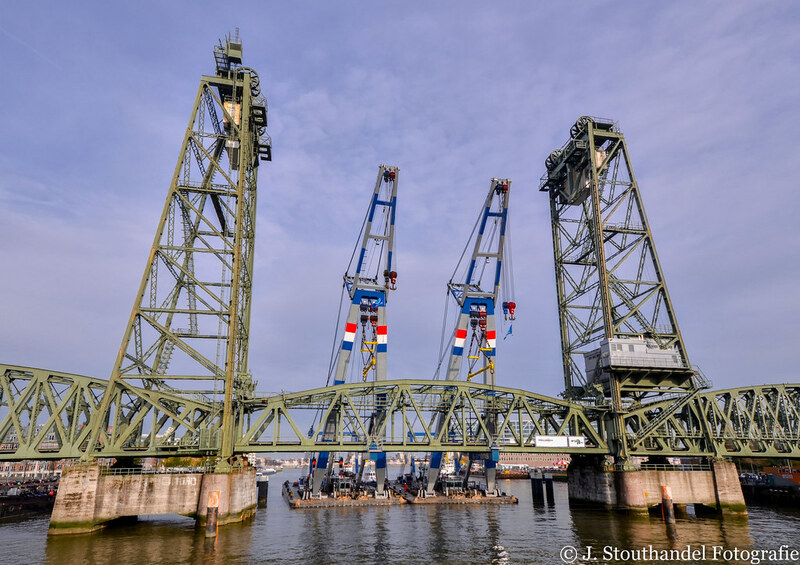 Thank you for sharing them! 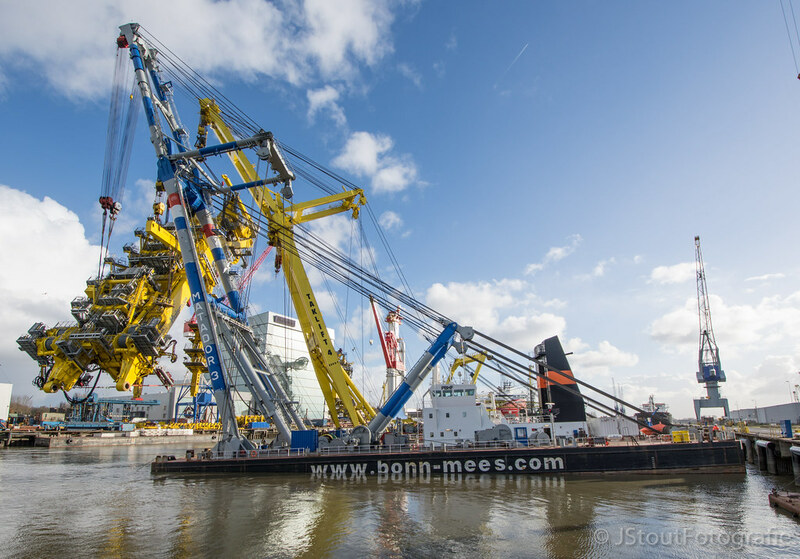 ‎April‎ ‎23‎, ‎2015; Huisman Quayside Schiedam, installing a 650mt pipelaytower with a weight of 2200! 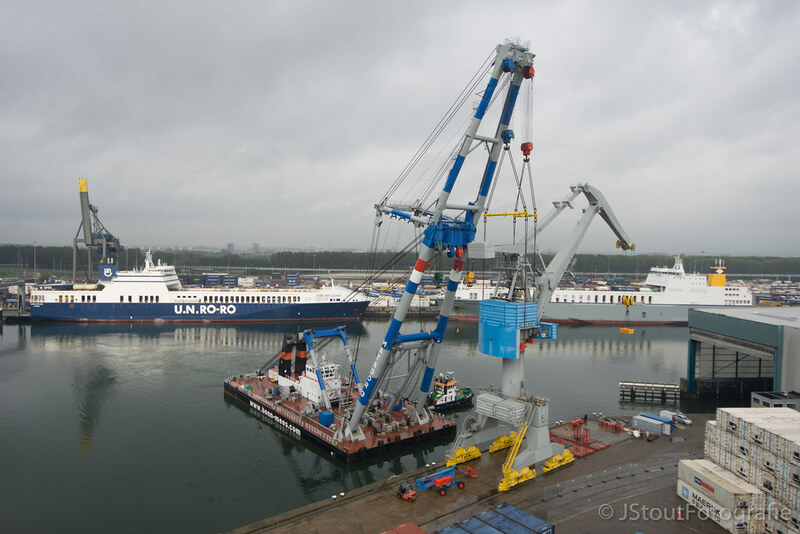 tonnes on the Techdofs Skandi Africa with the Matador 3 and Taklift 4. 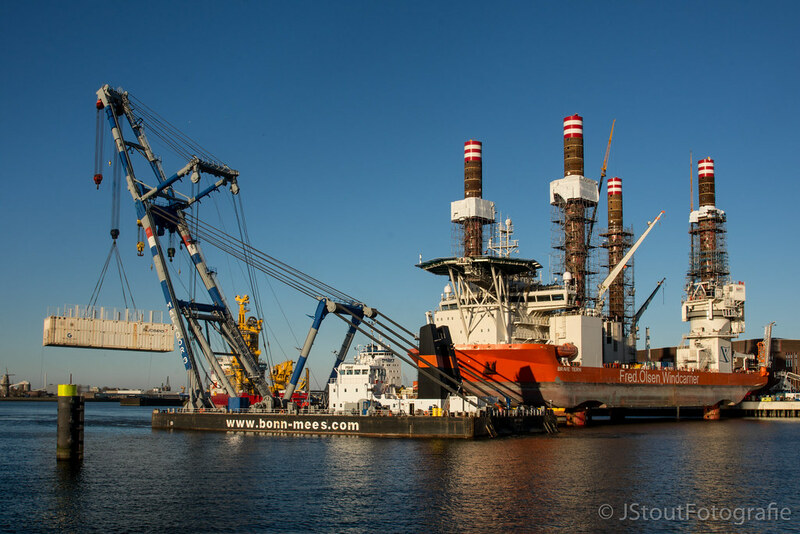 August‎ ‎13‎, ‎2015; Franklin Offshore Rotterdam (NL), placing the top of a Pipelaytower of the Supera Jade with the Matador 3. 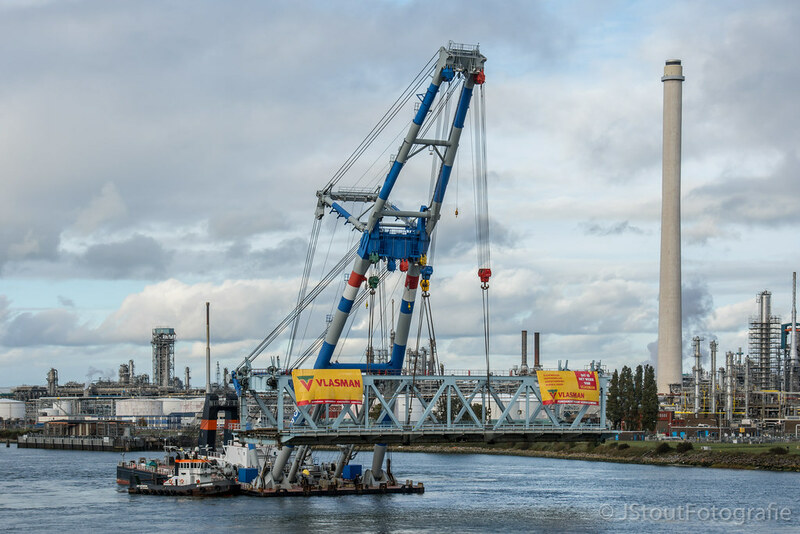 Die Farben...das sieht ja alles aus wie Lego!!! 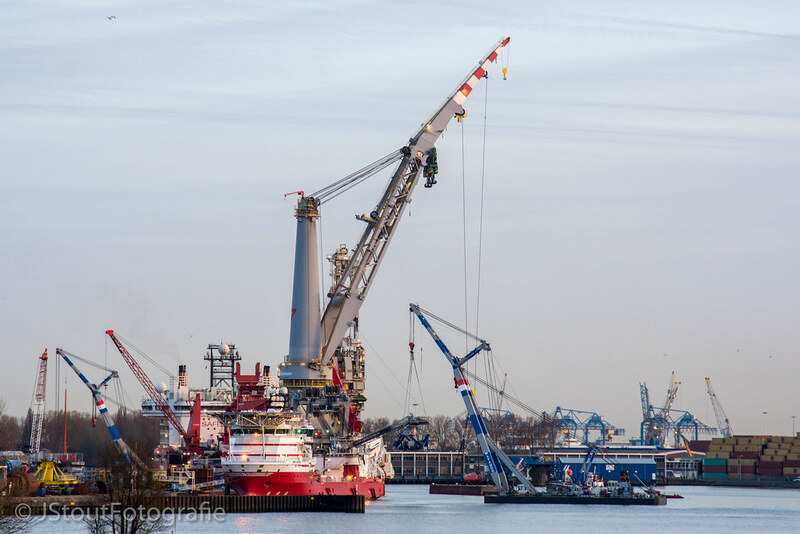 ‎January‎ ‎16‎, ‎2016; Huisman Quayside Schiedam, Matador 3 and Taklift 4 placing a 650mt pipelaytower with a weight of 2200t on Technip's Skandi Acu. 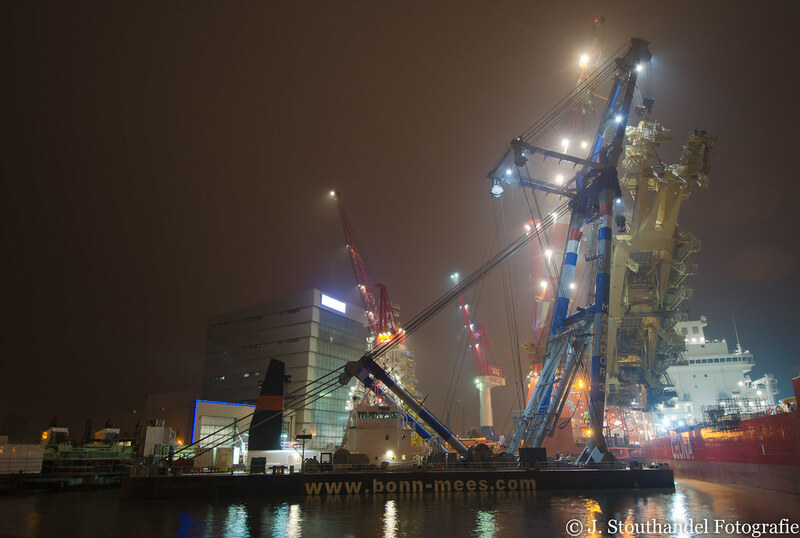 Dieser Post wurde am 15.10.2017 um 22:55 Uhr von jelco editiert. 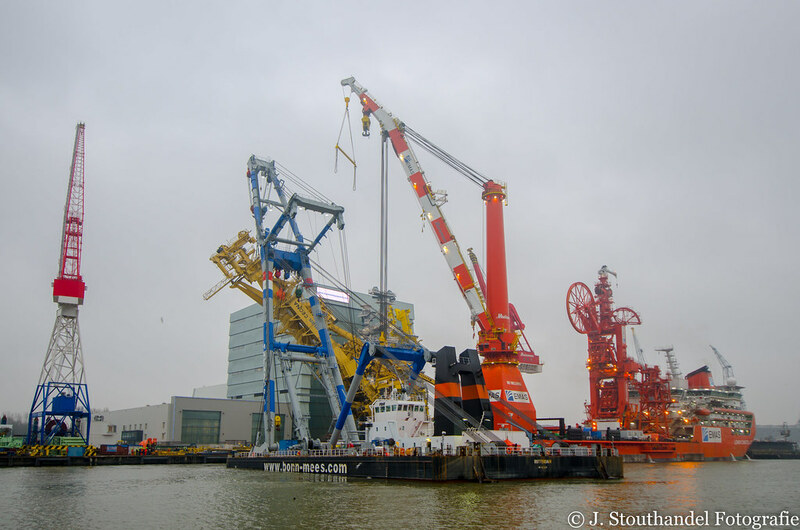 ‎January‎ ‎17‎, ‎2016; Franklin Offshore Heijplaat Rotterdam, Matador 3 taking out 3 heavy sea containers with a weight of around 150 tonnes out of a BigLift ship to the quayside. 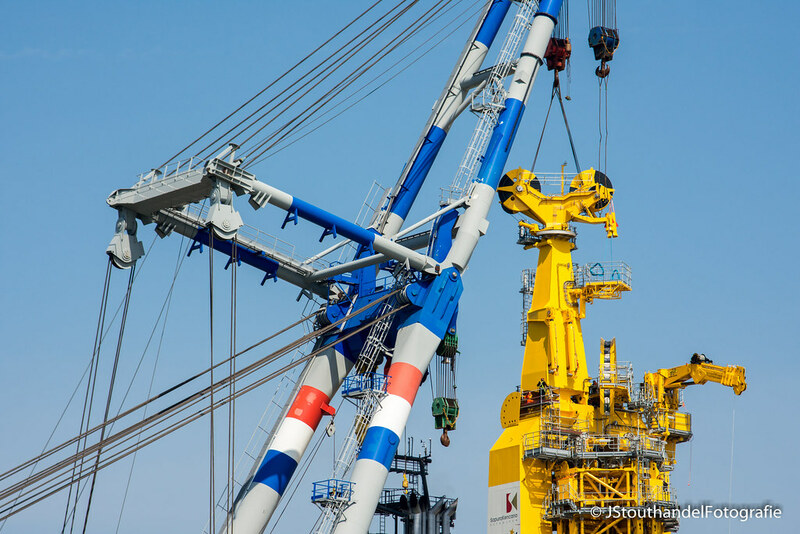 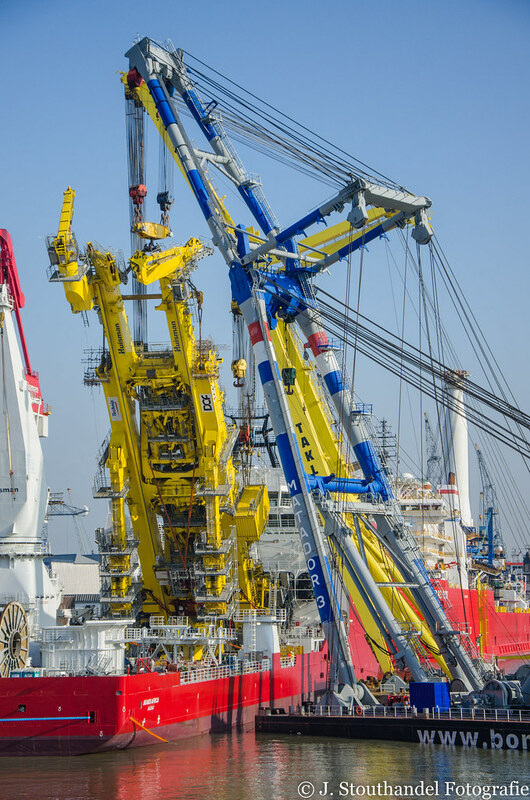 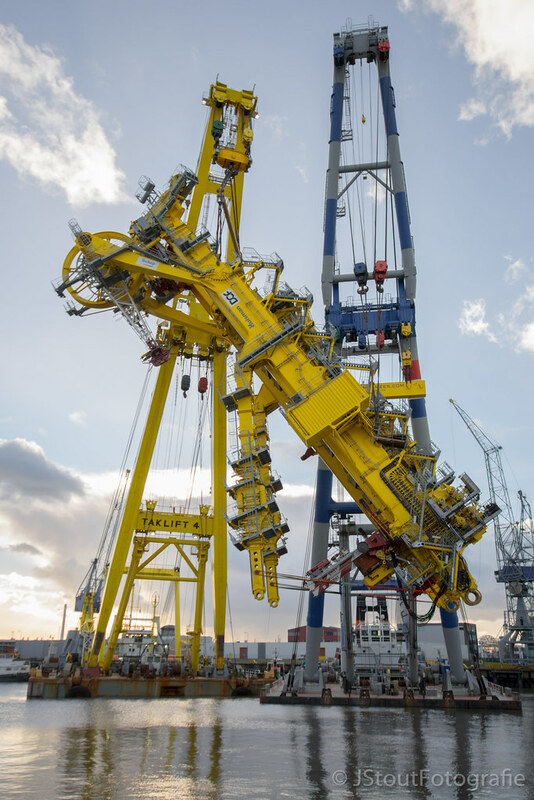 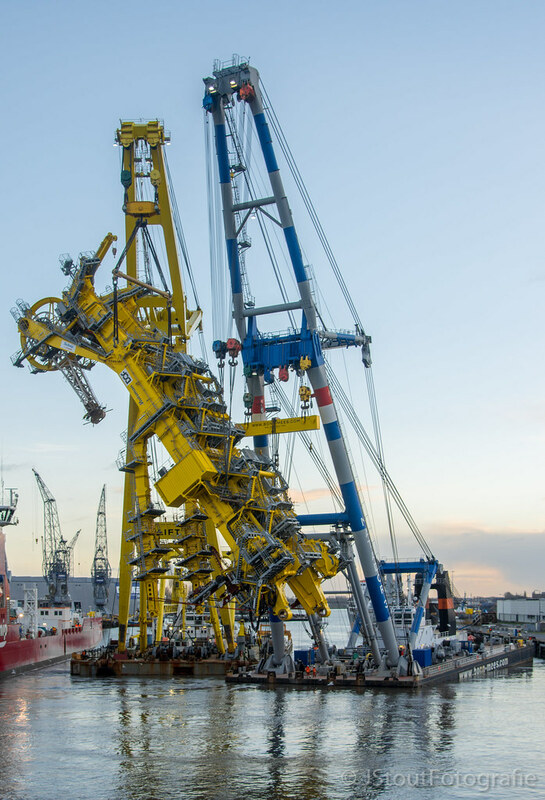 ‎May‎ ‎1‎, ‎2016; At the yard of Franklin Offshore, All 3 Matador's doing a trio by Lifting a 'small size' jacket to the vertical position with a weight of 1000 tonnes. 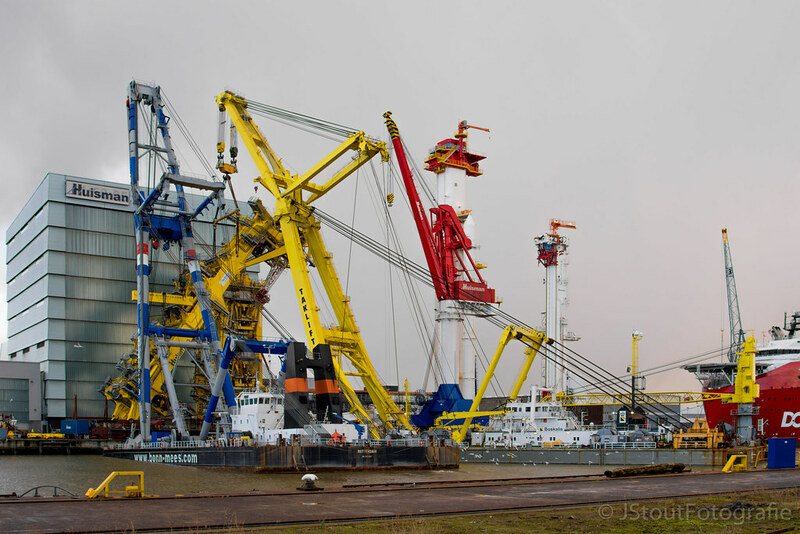 ‎March‎ ‎13‎, ‎2017; Franklin Offshore, The Matador (Where is it???) 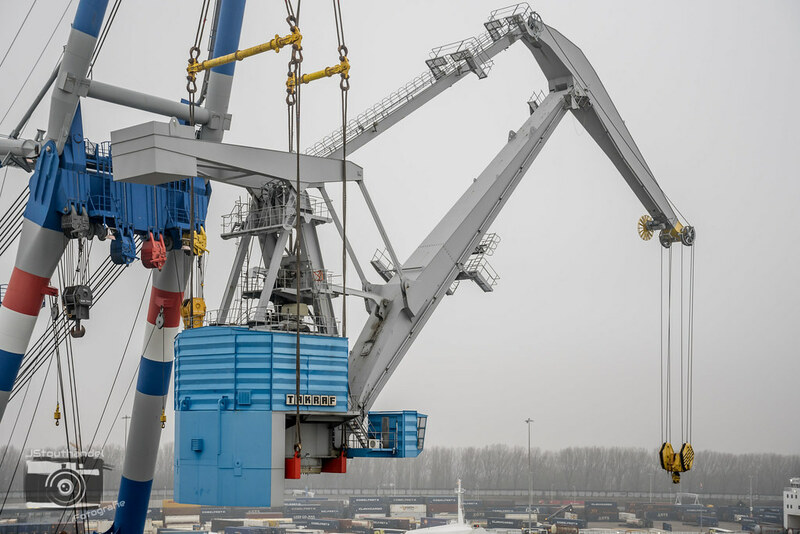 lifting a Ampelmann Motion Compensated Gangway. 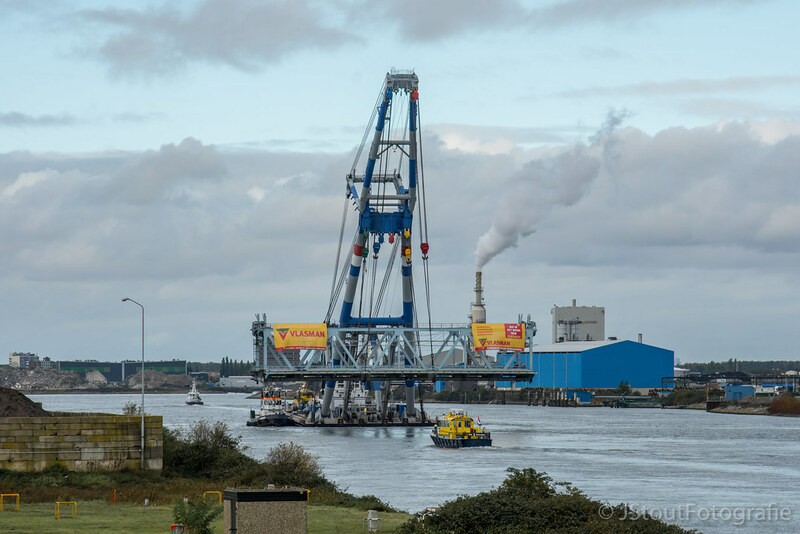 This picture is actually taken from my livingroom. 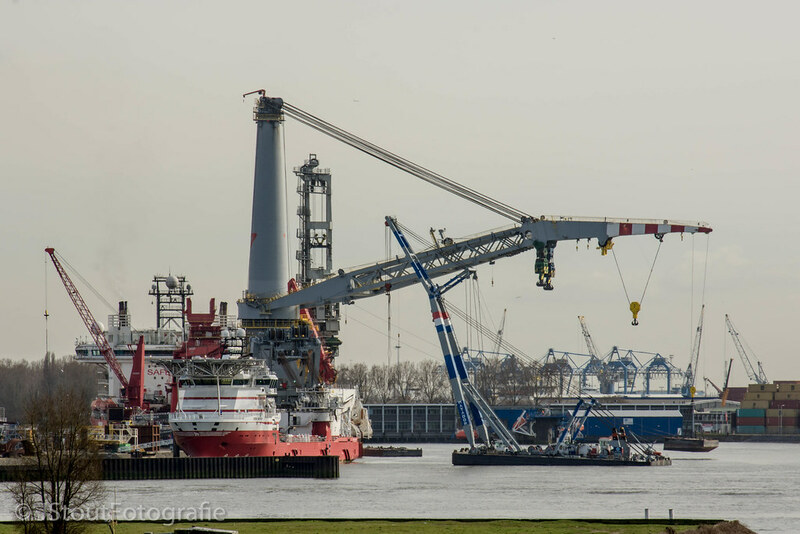 ‎March‎ ‎15‎, ‎2017; Same place again, The Matador 3 also with a Ampelmann. 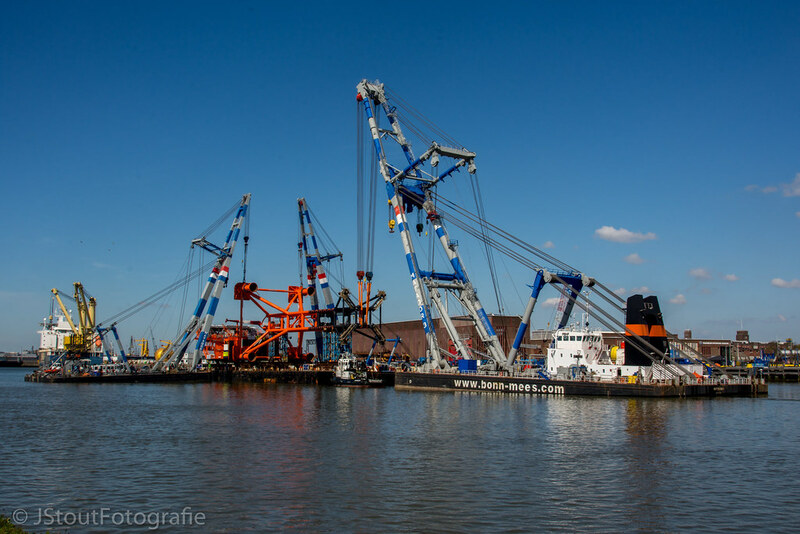 Dieser Post wurde am 15.10.2017 um 23:09 Uhr von jelco editiert. 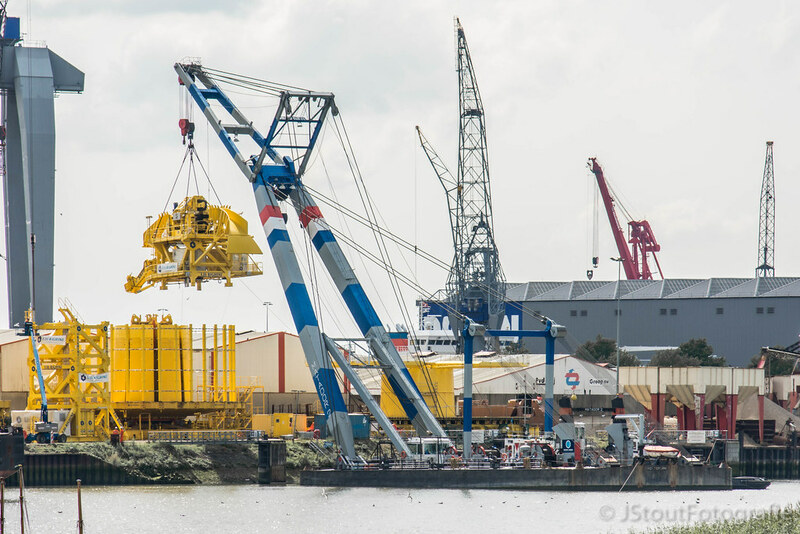 ‎July‎ ‎31‎, ‎2017; Saipem Quayside in Schiedam, Matador 2 lifting a piece of a cabledrum. 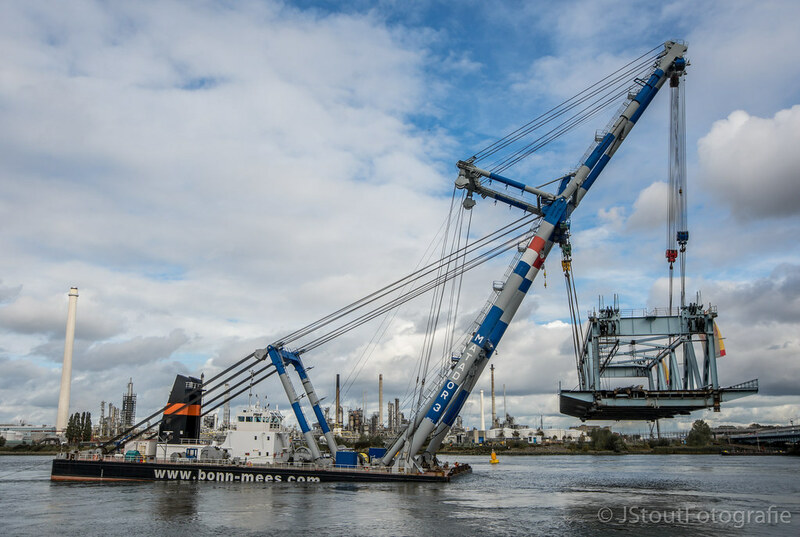 October 4, 2017; Schiedam, Matador 3 taking several big hammers from the Yard of Saipem onto a big barge. 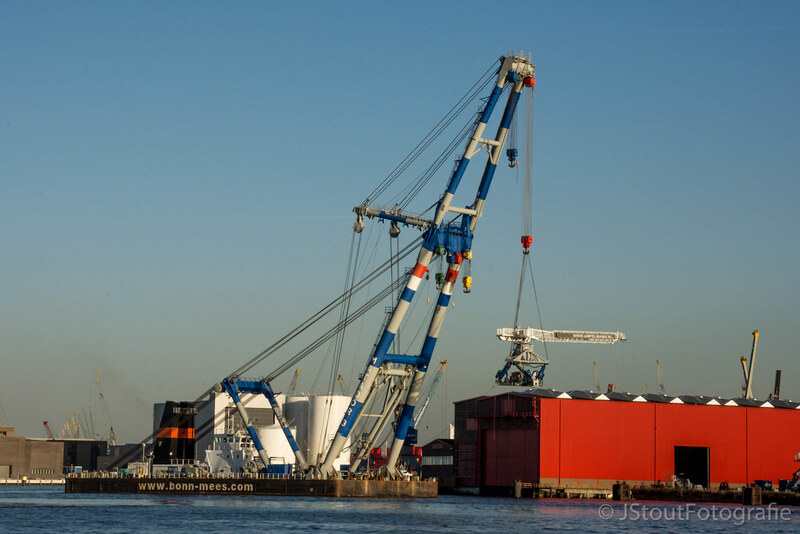 Dieser Post wurde am 15.10.2017 um 23:22 Uhr von jelco editiert. 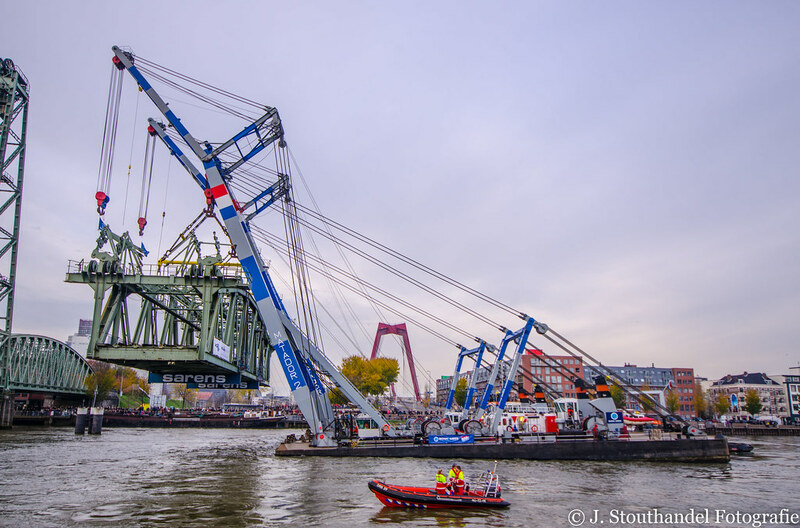 ‎October‎ ‎8‎, ‎2017; taking out the old Botlekbridge in Rotterdam (Botlek) with a weight of around 975 tonnes. 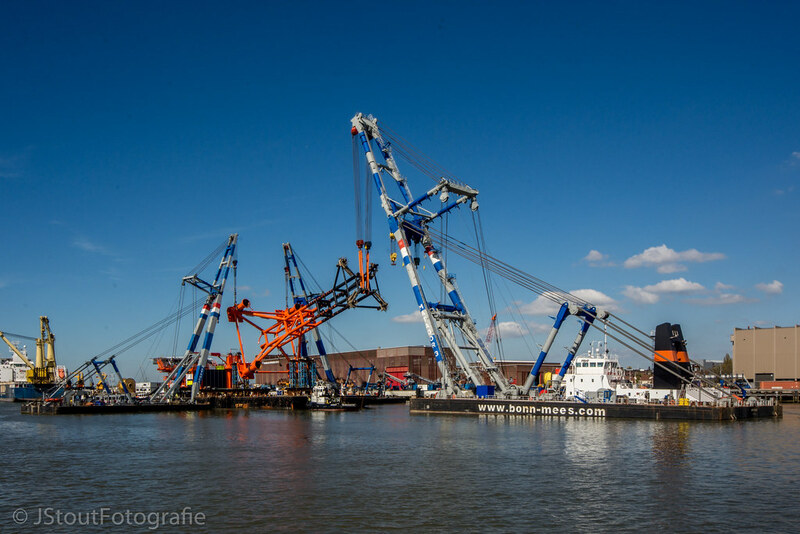 And bring it to the scrapyard in Vlaardingen. 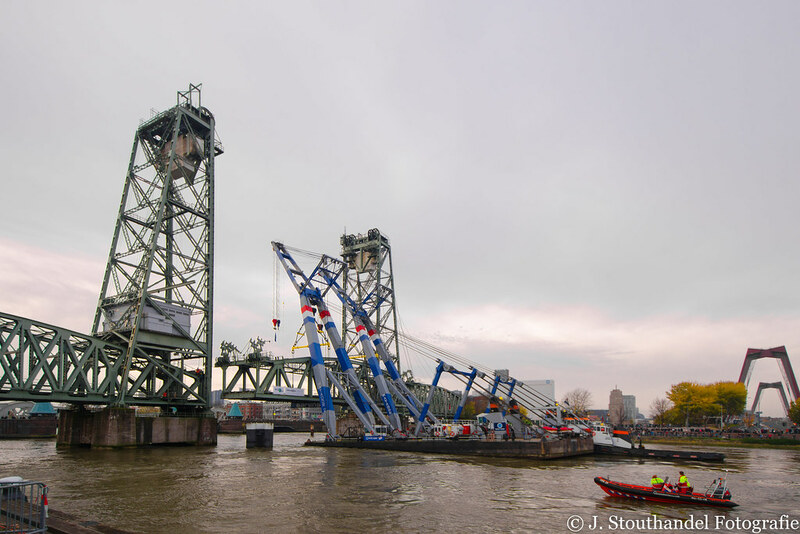 Taking of the upperstructure of a Takraf harbourcrane to replace the slewing-ring. 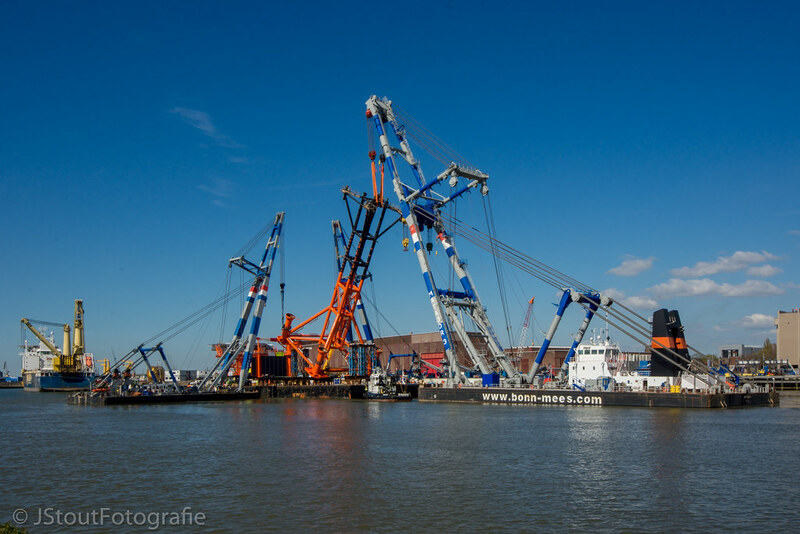 the weight was around 690 tonnes. 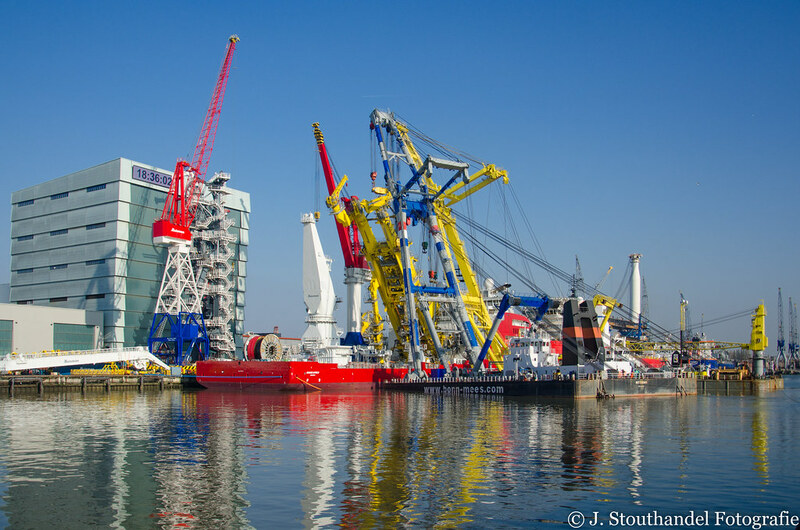 Unfortunatly I had no time to wait for the lift which was the other day. 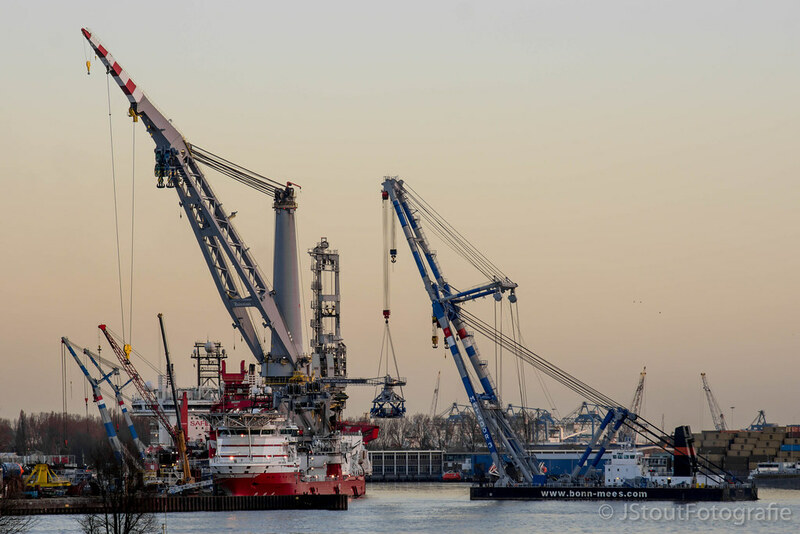 Sehr schöne Bilder, danke dafür. 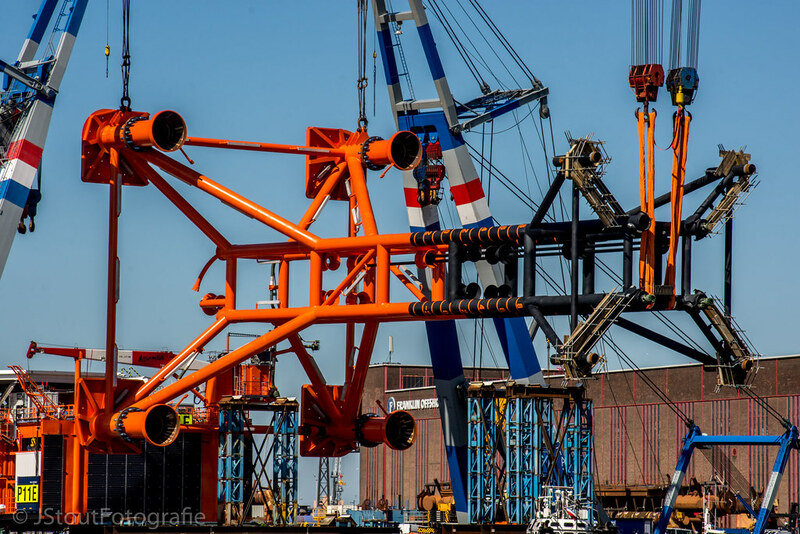 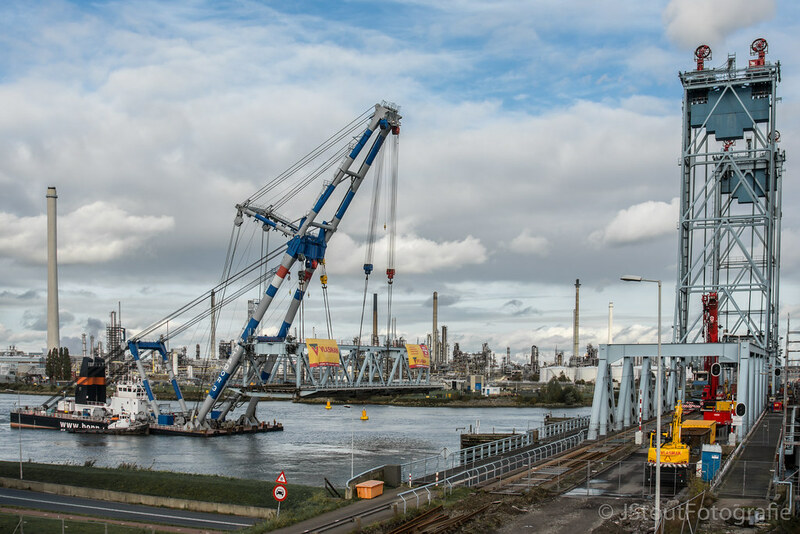 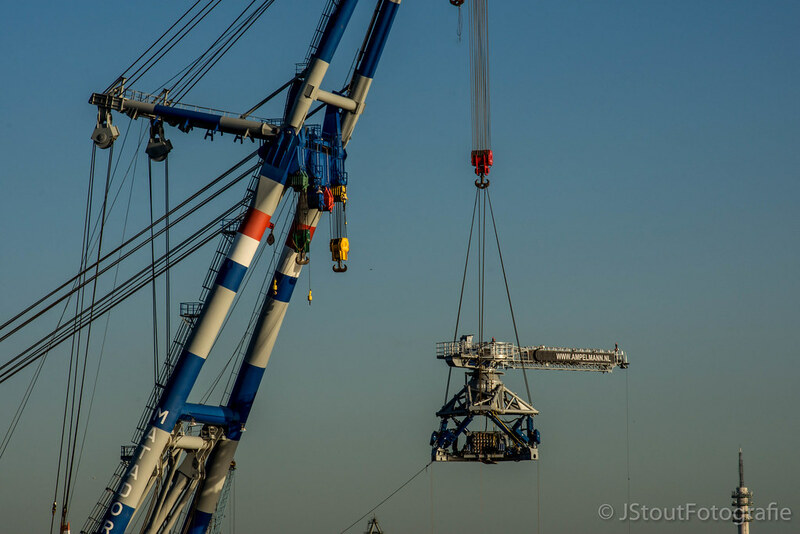 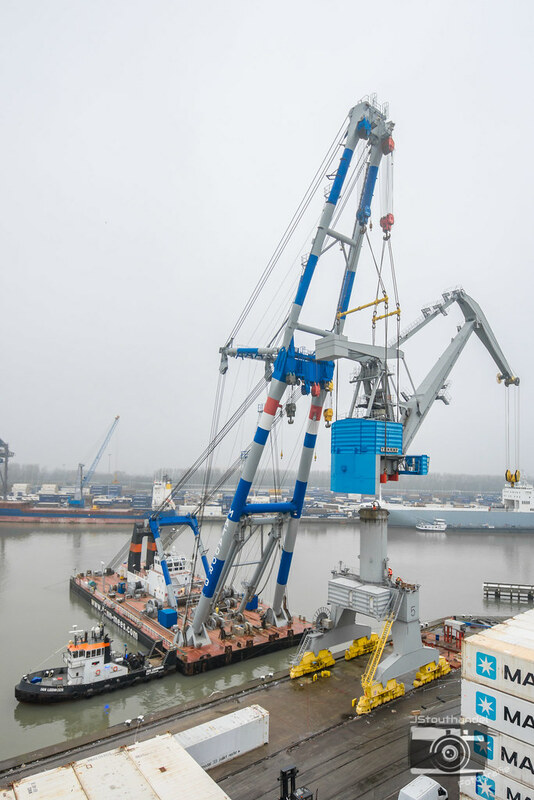 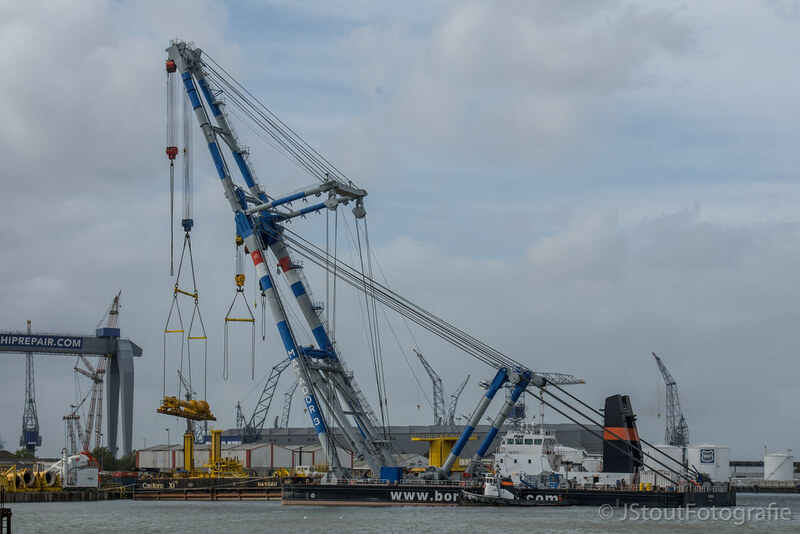 Lifting back the superstructure of a TAKRAF at the Broekman terminal in Rotterdam with a weight of 690t back onto it's leg with the Matador 3 after replacing the slewingring.